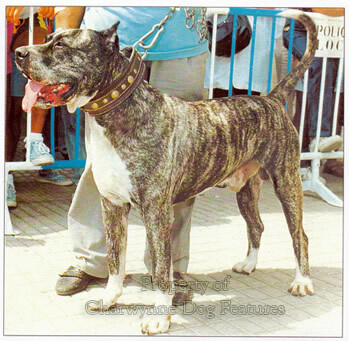 The Spanish and Portuguese influence on the hunting mastiffs of the world is a considerable one, from the fearsome Alanos of the baiting ring and the renowned Cordoba Fighting Dog of the pit to the broad-mouthed breeds of the Balearics and Central and South America, the latter still with us today. 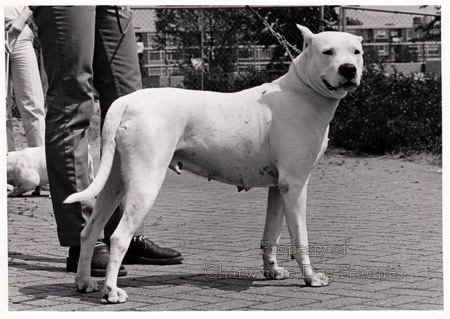 The Martinez brothers claimed to have utilised the blood of the Cordoba Fighting Dog in the creation of the Dogo Argentino. The Alano is behind the 'holding dogs' found in the Canaries: the Perro de Presa Canario or Canary Dog, in Majorca: the Perro de Presa Mallorquin as well as the Cuban Mastiff or Bloodhound, now lost to us, and the Puerto Rican breed, the Gran Mastino de Borinquen. Some were used in the boarhunt; others were utilised as shepherds' mastiffs. The Fila Brasiliero, strangely banned in Britain, is a famed big-game hunting dog in Brazil. We still have a similar type, calling them Bull Lurchers, often displaying a comparable physique to the Iberian dogs. An Alano was imported into Britain by the well-known Victorian dog-dealer Bill George and was described as a huge Bulldog, rather than as a breed in its own right. (The re-created Regency Bulldog produced much later by the late Clifford Derwent was remarkably similar in appearance to the Alano). Bill George's dog, 'Big Headed Billy', weighed 90lbs. Thirty years later, another British breeder called Marquand imported two more and then Frank Adcock, a well known Mastiff and Bulldog breeder, brought over two more; all these imports weighing 90lbs. This led to great opposition and eventually to the formation of the Bulldog Club to save the British Bulldog from what was termed the 'threatened invasion of the Spanish bulldog' and the 'impending introduction into its veins of blood of the Spanish milk-cart dog.' How silly dog fanciers can be at times! Whatever the quality of these imports, they were genetically important and were subsequently bred from, although not as part of Bulldog development in Britain. It may be no coincidence that 90lbs 'bull-and-mastiffs' were utilised about that time as gamekeepers' nightdogs. But the name of the Spanish broad-mouthed dog, Alano, is significant. The Alans settled in France, north Africa and Spain in the fifth century after wanderings from southern Asia through central Europe via the Ukraine, the Crimea, Hungary and Roumania. 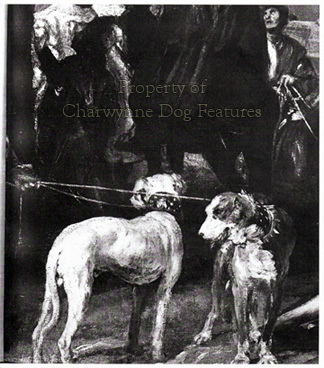 Great horsemen, they brought the famous 'Alauntes', or huge hound-like dogs, most likely a blend of Greyhound and Mastiff rather than a breed, with them, to bequeath us the strong-headed hunting mastiffs. 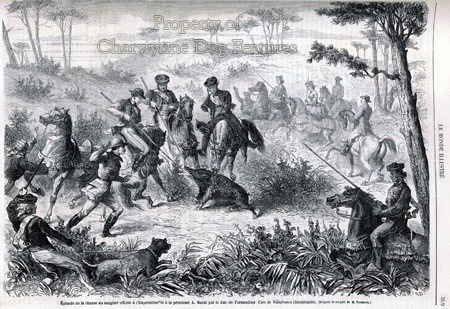 If you read accounts of the Spanish conquistadores in south and central America, such as the Varners' book 'The Dogs of the Conquest', published by the University of Oklahoma Press in 1983, their description of the dogs used to suppress the native Indians is almost identical with that of Alauntes provided by De Foix, who lived near the Pyrenees, in his valuable book on hunting of the fifteenth century. He wrote of these dogs being "...hardy to take all kinds of beast without turning, and hold fast and not leave it...they have a great head...and...help themselves at the baiting of the bull and at hunting of a wild boar, for it is their nature to hold fast". He stressed, incidentally, that whatever type they displayed, they were all hounds. From such a background have come the surviving broad-mouthed breeds of Spanish origin. One of these, the Canary Dog or Perro de Presa Canario (seizing dog of the Canaries), is now well established after being threatened with extinction several times. 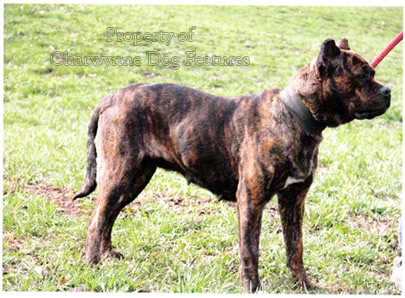 Antonio Gomez Ramirez, president of the Club Espanol Del Presa Canario, has kindly supplied me with some background on the breed. In the 16th and 17th centuries they were used as cattle dogs, guard dogs and by butchers. The Canaries became an important staging post for ships en route for the Americas, with Alanos and hunting dogs from Spain on board and taken ashore. The Bardino or Majorero of Fuerteventura, a powerful watchdog, is alleged to have been used in breeding programmes, to give the brindles in the breed an almost green-gold colouration. Sadly, in the 18th and 19th centuries the breed was extensively used in dog-fighting and this persisted into the 20th century, until this activity was finally banned. The breed then declined and the islands suffered an influx of foreign breeds, with the effect that the breed faced extinction in 1960. As is so often the case a small group of local enthusiasts persevered in country areas, until the urban demand for silent, formidable-looking guard-dogs brought renewed interest in the breed. In the 1980s a group of breeders from Tenerife initiated a programme to secure the desired traditional type and select breeding stock. In 1986 a breed show was held for 150 dogs and three years later the official breed standard was issued and accepted by the Spanish equivalent of our Kennel Club. 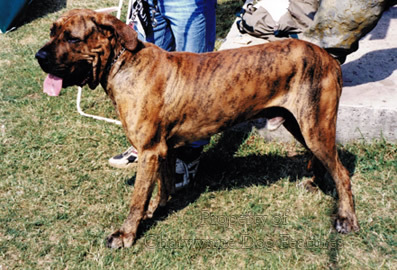 The sister breed of Perro de Presa Mallorquin has a similar appearance but a different origin. Sometimes called the Mallorquin Bulldog, but known to the Catalans as Ca de Bou, it was traditional to crop its ears in a rounded form to achieve an almost feline look. These dogs were widely used in dog-fighting, even being exported to the Spanish islands of the Caribbean for this purpose. The specimens that I have seen at World Dog Shows have been calm, friendly, equable and stable in temperament. How like humans and legislators in particular to blame such dogs for being made by humans to fight each other. I do hope this breed doesn't get proscribed as a result of disgraceful deplorable human behaviour in past times. Our Victorian writers sometimes made reference to a Cuban Mastiff or Cuban Bloodhound. In his 'The History of the Dog' of 1845, WCL Martin wrote of: "...a dog of Spanish descent termed the Cuban bloodhound. 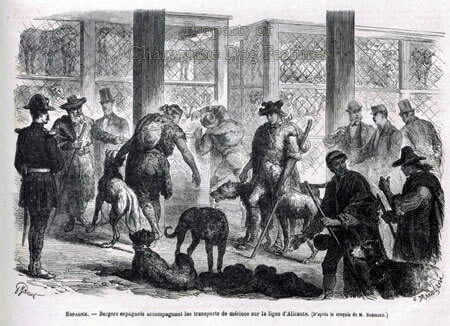 A hundred of these sagacious but savage dogs were sent, in 1795, from the Havanna to Jamaica, to extinguish the Maroon war...they were accompanied by forty Spanish chasseurs.. the dogs, muzzled and led in leashes, rushed ferociously upon every object". In his 'Th e Dog' of 1854, William Youatt writes: "The mastiff from Cuba requires some mention...He was not a native of Cuba, but imported into the country." 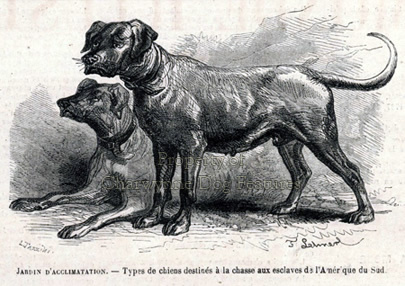 According to Hutchinson's Dog Encyclopaedia of 1934, a pair of these dogs was presented to the Zoological Society of London about 1832. They were described as being not unlike a 16th century English Mastiff, with a broad head, short muzzle, drop ears, a short close coat and heavily developed lips. If you consider all these modified brachycephalic breeds associated with the Spanish, then add those associated with the Portuguese -- the Filas of Brazil and the Azores, it is clear that the Iberian peninsula has had a major role in the development of the mastiff-type dogs. Such dogs were favoured both in the hunting field and as man-hunters in times when the Spanish and Portuguese were at their zenith as colonists and overseas adventurers. However questionable in today's more enlightened times, the activity and capability of such huge fierce dogs gave their owners and handlers an enormous advantage over even much larger numbers of hostile natives, perhaps the difference between winning or losing a battle. They therefore played a key role in securing Spanish and Portuguese possessions overseas, however distasteful that role is regarded in 21st century thinking.